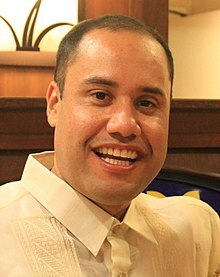 Donovan M. Dela Cruz (born July 6, 1973 in Wahiawa, Hawaii) is an American politician and a Democratic member of the Hawaii Senate since January 19, 2011 representing District 22. Dela Cruz earned his BAs in communications and journalism from the University of Oregon. 2012 Dela Cruz and his 2010 Republican opponent Charles Aki were both unopposed for their August 11, 2012 primaries, setting up a rematch; Dela Cruz won the November 6, 2012 General election with 10,393 votes (69.2%) against Aki. 2010 When Democratic Senator Robert Bunda ran for Lieutenant Governor of Hawaii and left the Senate District 22 seat open, Dela Cruz won the four-way September 18, 2010 Democratic Primary with 3,005 votes (37.8%) in a field which included Representative Michael Magaoay, and won the November 2, 2010 General election with 8,738 votes (67.3%) against Republican nominee Charles Aki. ^ "Senator Donovan M. Dela Cruz". Honolulu, Hawaii: Hawaii State Legislature. Archived from the original on September 30, 2014. Retrieved December 5, 2013. ^ "Donovan Dela Cruz's Biography". Project Vote Smart. Retrieved December 5, 2013. ^ "Primary Election 2012 - State of Hawaii - Statewide August 11, 2012" (PDF). Honolulu, Hawaii: Hawaii Office of Elections. p. 2. Retrieved December 5, 2013. ^ "Primary Election 2010 - State of Hawaii - Statewide September 18, 2010" (PDF). Honolulu, Hawaii: Hawaii Office of Elections. p. 2. Retrieved December 5, 2013. ^ "General Election - State of Hawaii - Statewide November 2, 2010" (PDF). Honolulu, Hawaii: Hawaii Office of Elections. p. 1. Retrieved December 5, 2013. This page was last edited on 24 September 2018, at 19:30 (UTC).